Cattle are stunned using a captive bolt stunner which produces immediate insensibility. 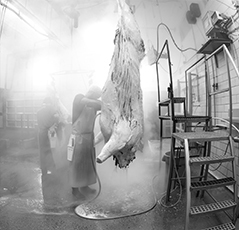 This method is approved as a humane method of slaughter and each animal is observed before, during, and after stunning by a USDA inspector that is present whenever any cattle are slaughtered at this facility. We also have a robust humane handling program established which we monitor at all times and USDA verifies on a regular basis. Proper treatment of livestock is critical to our success as a business and we continue to improve and adjust our processes as necessary to ensure that this critical step is performed correctly. Please see the Animal Handling at Smuckers for the animal handling guidelines that we adhere to. Available for beef carcasses and the first 2 weeks are included with the price to cut & package the carcass. After 2 weeks there is a minimal charge for dry aging and it is calculated based on the dressed weight of the carcass. Please view our policy regarding dry-aging. All products are vacuum packaged in clear plastic and labeled according to the cut or product in the package. Labels are printed in black and white and contain the necessary information to comply with USDA’s mandatory features for a product label. Custom Logos can be inserted on product labels but will need to fit into a predetermined space on the label. If you have a logo that you would like on your products, please contact us and we can work with you to accomplish this. Names of products and cuts have been approved with USDA and we are unable to change names of cuts and products. 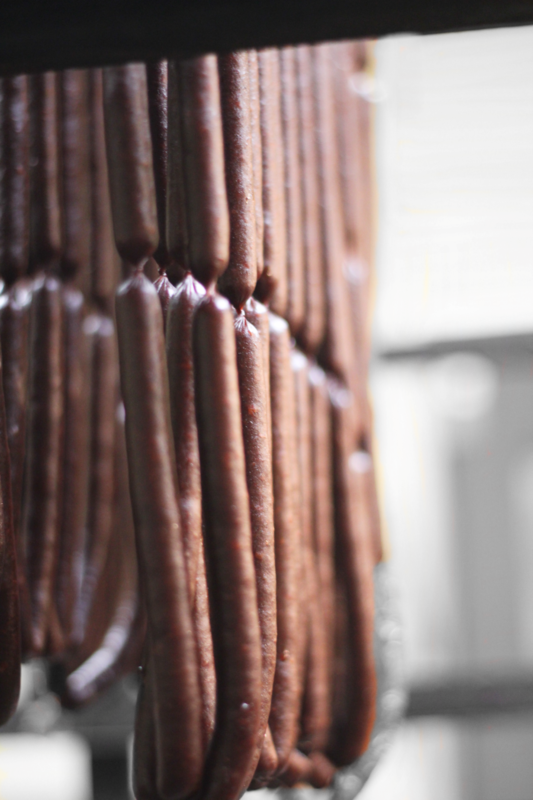 Further processing encompasses all of the products that we offer beyond simple cuts of meat and burger and patties. Products such as Jerky, Snack Sticks, Hotdogs, and more are available as options if you want to add value beyond cuts and burger. Production and Marketing claims are allowed but will need to be submitted to USDA for approval prior to use. Certain terms or claims may require more information in order to obtain the necessary approval. Contact us for more information regarding claims and if it makes sense for your business. This book has been helpful to us and the customers that we serve by clarifying the necessary steps and elements for successfully marketing beef. Click here for more information.